1979 The 1979 Mustang IMSA(International Motor Sports Association) is a performance prototype designed by Ford's group which eventually became Ford Racing. Elements include large 12 inch wide Gotti wheels, blanked off grille, hood louvers, rear facing shaker hood scoop, air-flow sealed headlamp trim, windows flush with outside body panels (the side windows are flip out), ten bulb rear light strip. Under the hood is a 132hp, 2.3L, turbo engine. Inside is a dark plexiglass covered instrument panel, a sport steering wheel, Recaro rally leather bucket seats. 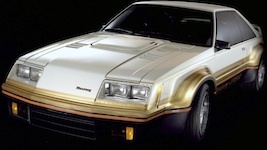 Several IMSA Mustangs were built by Ford in 1979 through the 1982 model year.